EVS, which is administered by Léargas, funds volunteers from one European country to spend time – typically six to 12 months – working as a volunteer in a not-for-profit organisation in another country. Everyone benefits: the volunteer gains experience, skills and an insight into a different way of living, while the host organisation, and those it cares for, benefit from the energy and enthusiasm of the young person, while learning about another culture. All costs, including the pre-departure training, travel, accommodation and subsistence are paid; volunteers also receive a small monthly allowance as ‘pocket money’ during the project. What is the age limit to participate in EVS? The EVS is open to young people between 18 and 30 years. For details please contact your National Agency or the SOS Volunteer Helpdesk. Where can EVS projects take place? The European Voluntary Service concerns all countries involved in the YOUTH programme. But there are some rules and conventions as to who can go where. For more information, click here. Where do I get contact details of host organisations? Contact details of potential host organisations are available in the European database on accredited host organisations. It is necessary to collaborate with a sending organisation for making contact with potential host organisations. If living in a Partner Country, volunteers can contact international voluntary organisation to have more information about potential host projects. Who can be my sending organisation? EVS sending organisations are non-governmental organisations/associations, local/regional authorities or other non-profit initiatives active for example in areas of social, cultural, environmental, community or youth work. Some of the YOUTH National Agencies publish contact details of potential sending organisations in their country. Please email the volunteer office with any questions you may have. I left Germany to come to Ireland in the middle of September for nine months volunteering with the Dublin Simon Community and –to be honest- I had doubts if I could manage my new life in Ireland. A new country, another language, a different culture and new work experiences – I think I was a little bit naive before I arrived as I never got in touch with homeless people before and had no knowledge how to work with homelessness. Of course, I was confronted with so many different destinies, special histories and a mix of several emotions. What means that I needed my time to get used to the feelings and the atmosphere reflected in their faces when the residents in NCR, the high supported residential housing saw me for the first time: a mix between joy and happiness to see a new face, curiosity and interest but also doubts, confusion and skepticism. But from my first day as a full time volunteer in NCR I did enjoy every day. Day by day I was confronted with small and big challenges but I learned how to manage and deal with it. It was such an amazing feeling when people came to me asking for help as they accepted me as a person who can lend them a hand. During the year I recognized how valuable my volunteering is. Just to spend a little bit time with the people, listening to the stories of their lives and give them the feeling of being needed in the community is one of the most valuable things that you can do to a homeless person. They showed me that I could give something back. It is incredible when you recognize their life spirit and talking with so much courage, life energy and their way of thinking gave oneself more than anyone and anything else motivation and made me think about several topics in a completely different way. I learned a lot and gained many experiences during my volunteer year what made me feel proud to be a member of the Community for the last nine months but what made me even happier, I can now see how I could help and support my team while working with the residents. The staff members in NCR made me always feel welcome and let me feel as a part of their team as they supported me every day but also gave me free space to create my own ideas and innovate new thoughts how to be useful for the project what I incredibly thank for. 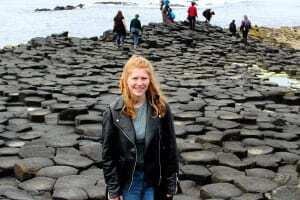 The decision to go to Ireland is one of the best I ever could have made as I met incredible people such as helpful colleagues, accommodating neighbors, friendly strangers and amazing new friends. I know I changed my way of thinking a lot, as today I would never pass any person who is asking me for change or is sitting in a corner sleeping rough without giving that person an extra moment and try to have a look inside, think about the individual history and the person behind that face. I was a German girl that just finished school and had never lived abroad or worked with homeless people before, when I first came to Ireland. I had no idea what I was going into, I just knew I wanted to leave home, go abroad, do social work, and improve my English. On the first day of my EVS placement in the high supported housing project North Circular Road (NCR) a whole new world opened up to me. I was welcomed by such a nice team of staff and lovely residents. They made me forget that I had a language barrier and my family and friends were far away. The staff from NCR helped me to feel home and supported me whenever I faced many challenges during my volunteering experience. They always answered my questions and helped me to gain the confidence to get to a point where I could give advice to others, answer questions, organise appointments and social activities for residents. My work with the Dublin Simon Community was challenging and I struggled with the language and situations I had never faced before, but eventually, I got used to it. I started to love the work with the residents more and more every day. My comfort zone expanded and I got more confident in trying out new things. Volunteering at NCR changed my view on society. It changed my attitude towards strangers in the streets, mental illness and addiction. I realised that a single conversation can cheer someone up. I see people with their stories now, sad or happy ones and I want to know them, I want to know what happened to them. The stories of the residents in NCR were sometimes breathtaking and also depressing. I am extremely thankful that people shared them with me and allowed me to be part of it, even if it was only for a year. I was impressed by the way the residents coped with their lives and difficult fate. It was amazing how my work was appreciated and how the residents showed it with a smile or a nice word. I will never forget my year in Dublin, my lovely house-mates, all the EVS volunteers around Ireland, the volunteers and staff of Dublin Simon, the Irish landscape and all the great moments I had when travelling around Ireland getting to know the Irish culture. It was great to make a change in our residents’ lives, to see some of them move successfully to own apartments or lower supported accommodation. I will definitely come back some day and see how new volunteers are making a change to our residents’ lives, but I can definitely say that these people changed mine. I’m not the shy German girl anymore. I’m a girl that dares to try the unknown and I even manage to understand all the different Irish accents. During my time at school, I already knew that I wanted to go abroad for a Gap Year. Due to my young age, I was not able to volunteer outside of Europe for one year. This is why I started looking for opportunities within Europe. My sending organisation then suggested the Simon Communities. Quite quickly it was clear to me that this was what I wanted to do, as I was amazed by the work they do. In the beginning of October, I found myself on my way to Dublin ready to start a new chapter of my life. After a couple of days of settling down in the new city and meeting loads of new people I started my time in “Chester House”, a high support housing project. As I never had worked with homeless people before, this experience first seemed very overwhelming. But with great staff welcoming me, I found my place within the service and the next thing I knew my nine months in Ireland had gone by. Though the work sometimes could be very challenging I loved my work the whole time through. Residents did not hesitate in telling me their life stories which made me understand so much more about the complexity of homelessness and the influences of trauma, addictions, mental health and many more. It was great to learn how simple things can brighten up a whole day for residents but also for me. I also realised how I gained confidence over the cause of working in my project. Nonetheless, I also learned how to live on my own and to find my way of living in a new country. One of the greatest things of the time as a volunteer was making friends from all over the world and experiencing all the different cultures working together. I have been volunteering for the Dublin Simon Community since September last year. Now after eight months and only a few weeks left to go, I can say that it has been the best time of my life so far. After I finished school at home in Germany I was sure that I wanted to leave my hometown and do something useful with my life for a change, that is why I applied for a position with the Simon Community in Ireland. Right from day one – from the first second on – I loved working in high supported housing Sean Mac Dermott Street. I stepped into a completely new world for me: A new town in a foreign country and my first fulltime role in a quite difficult environment. But everybody in Sean Mac welcomed me right from the beginning and tried to make it as easy for me as possible. I had so much luck with the staff – a bunch of noisy and crazy, but loveable people, who were a great support and a big help in every situation. I could build up step by step a trustful relationship to the main part of the 21 residents. They always showed great interest in the “German girl” and I enjoyed working with them, because I could make a difference to them. They appreciated my effort and I learned a lot from the guys in Sean Mac. We give them a home, a second chance or even a third and fourth chance, but you get so much back from them. Their life stories and all the problems they still have at the moment, influenced and changed my opinions a lot about homelessness, mental health and addiction. I found a second home in Dublin, in the volunteer house, and in my working place. I found awesome new friends and made so many experiences I will never forget. Living in Dublin is of course very different from living in my small hometown in Germany. There are many friendly and open-minded people who always show a great interest in foreign people and the work I am doing. I have never experienced so much sympathy and help from colleagues, neighbours, taxi drivers and strangers whenever I had a problem. Everybody appreciated the fact that I actually came to Dublin to work with homeless people. I will finish working for the Simon Community in two weeks and then leave Ireland a few weeks later, but I will always remember the great time I had here and Dublin will always be my second home.